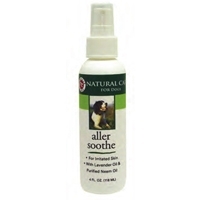 "Analgesic and Anti-Inflammatory Spray. Provides rapid relief of inflammation, pruitis (itchy skin) and associated conditions. Lidocaine: Relieves itching, burning and pain from skin inflammations. 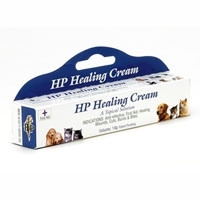 Hydrocortisone: Reduces the cause of inflammation, redness and swelling. Allantoin: Helps stimulate healing of wounds. Glycerin: Treats dry, rough, scaly, itchy skin and minor skin irritations.Wheat Germ Oil: Humectant & antioxidant properties moisturize & protect skin. " Fast-acting gel stops bleeding and disinfects too. 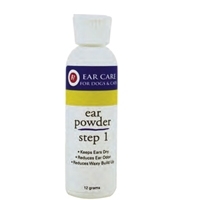 More convenient and sanitary than powders and less expensive! New easy-to-use syringe applicator. 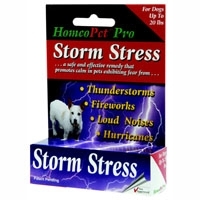 HomeoPet Storm Stress K-9 18-20 pounds 1.6 oz. 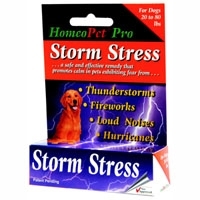 HomeoPet Storm Stress K-9 under 20 pounds 1.6 oz. 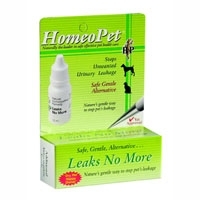 HomeoPet Leaks No More Multi Species 1.6 oz. 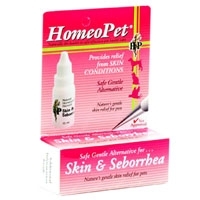 HomeoPet Skin & Seborrhea Multi Species 1.6 oz. Homeopathic remedy provides relief from the symptoms of skin conditions causing smelly skin & ears, dull, greasy coat, dandruff. 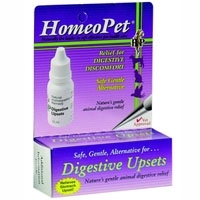 HomeoPet Digestive Upset Multi Species 1.6 oz. 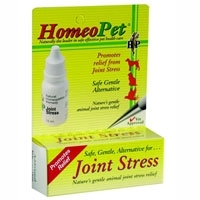 HomeoPet Joint Stress Multi Species 1.6 oz. 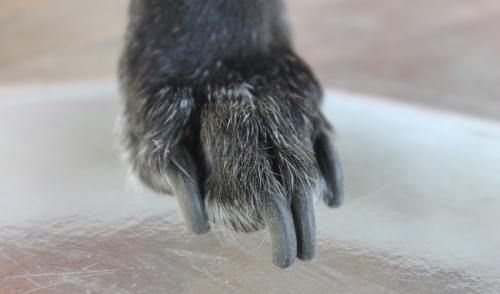 As pets age, they slow down. A homeopathic remedy to provide temporary relief from: Joint stiffness, soreness, muscle tension, overexertion, pain in lower back and joint areas. 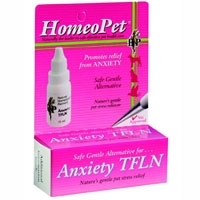 HomeoPet Anxiety TFLN Thunder, Fireworks, Loud Noises Multi Species 1.6 oz. 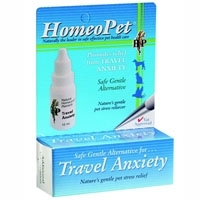 HomeoPet Travel Anxiety Multi Species 1.6 oz. Homeopathic remedy provides relief for: Motion sickness, fear of travel including cars, boats, trains, and airplanes/flying. 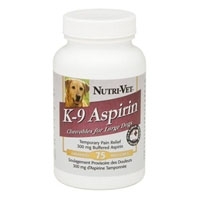 Vomiting, drooling, panting, restlessness and unwanted behavior can be helped with this fast acting, non-sedating liquid. 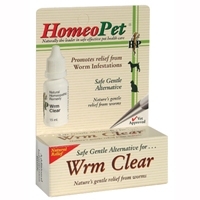 HomeoPet WRM Clear 1.6 oz. Aids in the recovery from worm infestation. Treatment of worm infestations where a drug-free approach is favored. Debilitation caused by severe worm infestation where concurrent use with conventional wormer is indicated. Reduces environmental contamination by suppressing worm egg production and thus reducing re-infestation. 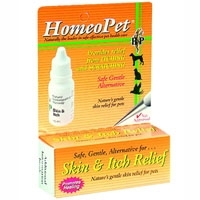 HomeoPet Skin & Itch Multi Species 1.6 oz. Homeopathic remedy provides temporary relief from constant scratching, itching, gnawing and hair loss caused by allergies. Helps to detoxify the skin from the inside, leaving the coat thick and shiny. 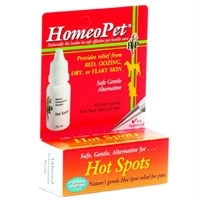 HomeoPet Hot Spot Multi Species 1.6 oz. 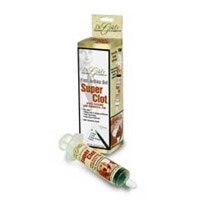 Homeopathic remedy provides relief for hot spots that are red and oozing or dry and flaky. 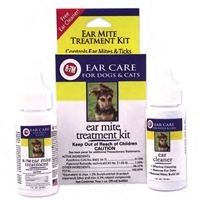 Supports healing where hair loss occurs from chewing and licking the hot spot area. HomeoPet Cough Multi Species 1.6 oz. 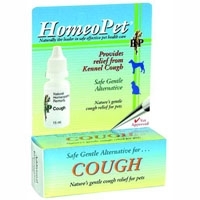 Homeopathic remedy provides relief from kennel cough, bronchitis and other types of persistent coughs. 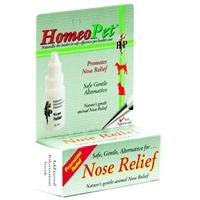 HomeoPet Nose Relief Multi Species 1.6 oz. A highly palatable form of buffered aspirin that aids in the temporary relief of pain and inflammation. Sensitive, allergic skin is itchy and uncomfortable, and your dog's scratching and biting at affected areas can cause infection. Employing premium quality botanical ingredients, Tummy Soothe, a homeopathic elixir from Gimborn, is specially formulated to calm and soothe the gut, allowing the system to right itself naturally. 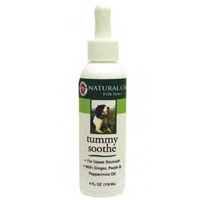 Features Botanical formula specially created to treat common stomach upset without a visit to the vet, Contains a unique blend of ginger root, pectin and essential oil of peppermint to quiet the tummy, No drugs or harsh chemicals. 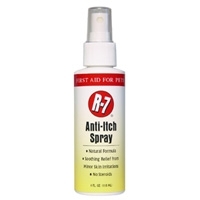 Gimborn R-7 Anti-Itch Spray 4 oz. 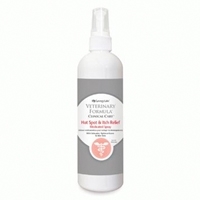 Hot Spot® lotion breaks the “hot spot cycle” by discouraging biting and chewing with a bitter taste and soothing irritated, itchy areas.